Months, or even years, of hard work in the lab and conducting research are on full display each year at USciences Research Day. The 17th Annual Research Day was no different with more than 240 poster presentations from undergraduate and graduate students from programs across all three of USciences’ colleges. The day kicked off at the 32nd Annual John C. Krantz Jr. Distinguished Lecture featuring Colleen L. Barry, PhD, co-director of the Center for Mental Health & Addiction Policy Research at Johns Hopkins Bloomberg School of Public Health. 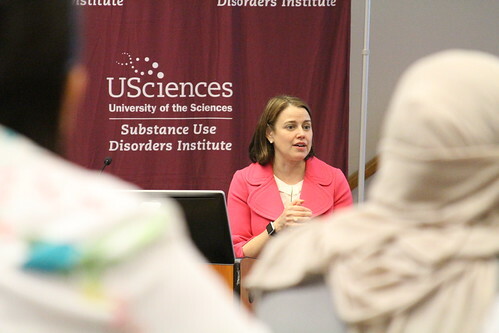 Her lecture entitle “Confronting the Stigma to Respond to the Opioid Crisis” focused on the vast stigma that exists related to the opioid epidemic and those suffering from the disease of addiction. Dr. Barry spoke about the three phased evolution of the opioid epidemic and how it became the largest public health crisis facing the United States, and discussed how the evolution has shaped stigma in the public, and even among the addiction and healthcare communities. “We need a wholly different approach to the epidemic because the things that were working previously aren’t working,” she said. She discussed the importance of medication-assisted treatment as well as reforming the language we use to discuss substance use disorders and those suffering from them in order to ensure that our descriptions aren’t perpetuating or triggering stigma. In the afternoon, hundreds of students dressed in their most professional attire pinned their research posters up and began discussing the findings of their work with interested faculty, staff, students and guests. The posters filled three gymnasiums inside the Athletic/Recreation center and investigators examined each-others findings and spurred discussion across fields and expertise. Student research spanned a wide variety of topics from pharmacists perceptions of medications used to treat Opioid Use Disorder to the impact of prosthetics on children and even a dive into the effectiveness of a ketogenic diet. For Sameer Akhtar BI’19, who presented two posters, one from his biology coursework and one stemming from his honors coursework focusing on feminism in rap music today, the experience is an opportunity to gain experience presenting and share ideas with his classmates.